Watch out when the trickster planet spins backward! Mental Mercury goes retrograde three or four times each year, and during this time we all go a little mental, too. That's because when the planet of communication and movement appears to spin backward, it interferes with our movement-based world. This interrupts and slows our communications, travel and business negotiations for about three weeks several times every year. But what exactly does "Mercury Retrograde" mean? 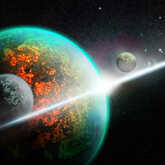 No planet ever moves backward literally. It is simply an optical illusion from our point of view on Earth, which happens because Earth orbits the Sun at a different speed than Mercury and the other planets. Mercury is a fast-moving planet, so it turns retrograde more frequently than any other planet. When Mercury goes retrograde, it feels like the universe is blocking your progress, so watch out for things like computer crashes, traffic jams, cars breaking down and airport delays. Don't sign any important documents, and don't make big purchases until the trickster planet turns direct.